Refer to “starter motor removal and installation” . 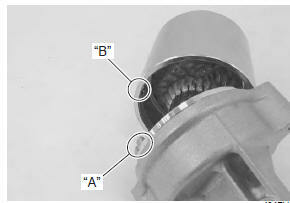 Disassemble the starter motor as shown in the starter motor components diagram. 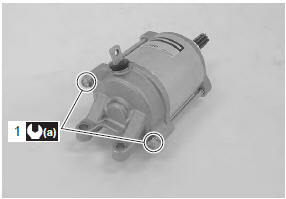 Refer to “starter motor components” . replace the o-rings with new ones to prevent oil leakage and moisture. Apply grease to the bearing and lip of the oil seal. Apply a small quantity of moly paste to the armature shaft. Fit the depression “a” on the housing end to the projection “b” on the case. 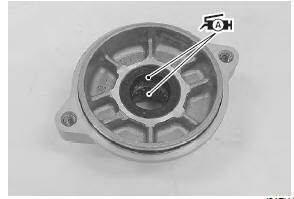 Tighten the starter motor housing bolts (1) to the specified torque.